This image shows modular fluidic and instrumentation components developed by researchers at the University of Southern California Viterbi School of Engineering. Thanks to new LEGO®-like components developed by researchers at the USC Viterbi School of Engineering, it is now possible to build a 3-D microfluidic system quickly and cheaply by simply snapping together small modules by hand. Microfluidic systems are used in many fields including engineering, chemistry and biotechnology to precisely manipulate small volumes of fluids for use in applications such as enzymatic or DNA analysis, pathogen detection, clinical diagnostic testing, and synthetic chemistry. Traditionally, microfluidic devices are built in a cleanroom on a two-dimensional surface using the same technology developed to produce integrated circuits for the electronics industry. Though tiny, designing, assembling and testing a new microfluidics system can take a lot of time and money. Building a single device can often require multiple iterations, each of which can take up to two weeks and several thousand dollars to manufacture. And the more complex the system, the higher the number of iterations needed. Frustrated that reproducing a simple microfluidic circuit could cost him so much time and money, Bhargava set out simplify the construction process. First, he identified the primitive elements commonly used in microfluidic systems, much like how circuitry is broken down in electrical engineering. Basic microfluidic functions would be separated into standardized modular components, not an entirely revolutionary concept. But then, he abandoned the two-dimensional method of building microfluidic devices altogether. Borrowing an approach from the electronics industry, which uses prototype boards to build circuits, Bhargava conceived of three-dimensional modular components that encapsulated the common elements of microfluidic systems, as well as a connector that could join the separate components together. Inspired by recent advancements in micron-scale 3D-printing, he and a USC Viterbi research team that included chemical engineering and materials science professor Noah Malmstadt and biomedical engineering graduate student Bryant Thompson, designed computer models for eight modular fluidic and instrumentation components (MFICs, pronounced “em-fix”) that would each perform a simple operation. Examples are a “helix” component that can mix two fluid streams and a component that contains an integrated optical sensor for measuring the size of small droplets. The components constructed for this study are approximately 1 cm3, slightly smaller than a standard 6-sided die. The team’s development of these MFICs represents the first attempt to break a device into separate components that can be assembled, disassembled and re-assembled over and over. The team attributes much of the success in the fabrication stage to recent advancements in high-resolution 3-D printing. “We got the parts back from our contract manufacturer and on the first try they worked out better than I could have dreamed. 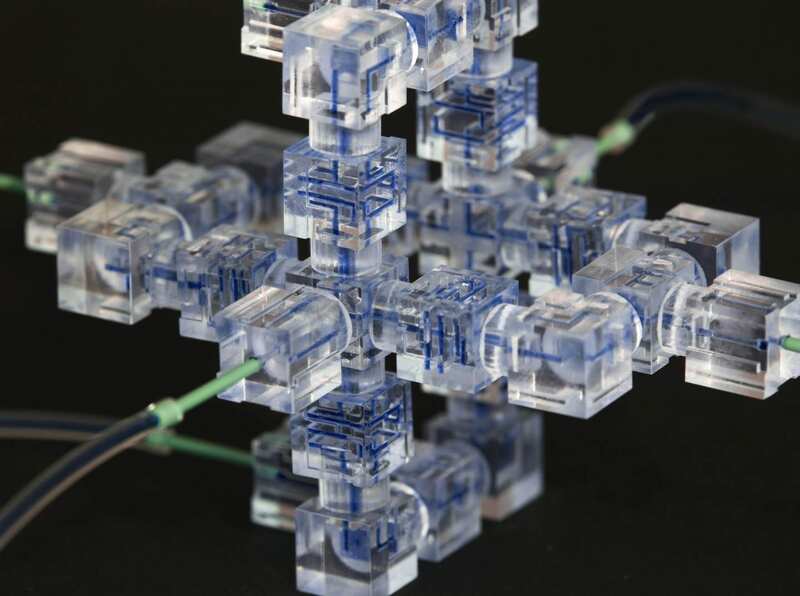 We were able to build a working microfluidic system that day, as simple as clicking LEGO® blocks together,” said Bhargava.